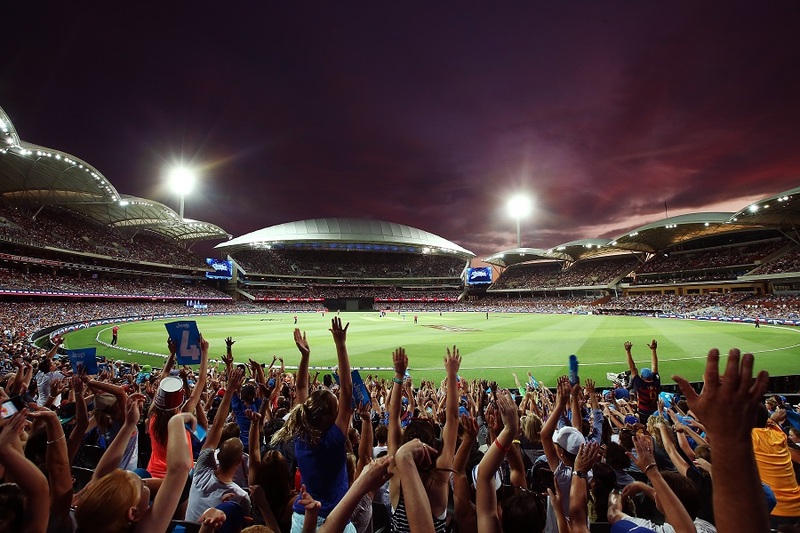 Ever since T20 cricket has established itself in the horizons of cricket, it has witnessed numerous T20 cricket leagues around the world paving its ways into the hearts and minds of the Global cricket fans. Moreover, while most of the leagues did focus on providing a big platform for the young cricketing talent in the respective country, the “Money Factor” has also been kept into mind alongside. T20 leagues like Indian premier league, Big Bash league, Pakistan super league, Caribbean premier league, Bangladesh premier league, and NatWest T20 blast are some of the examples which have provided all those young cricketers a chance to play along with some of the best International cricketing stars of the current age. Still, when it comes to evaluating the “Popularity quotient” amongst all of them, IPL is that one tournament which stands out amongst the rest. 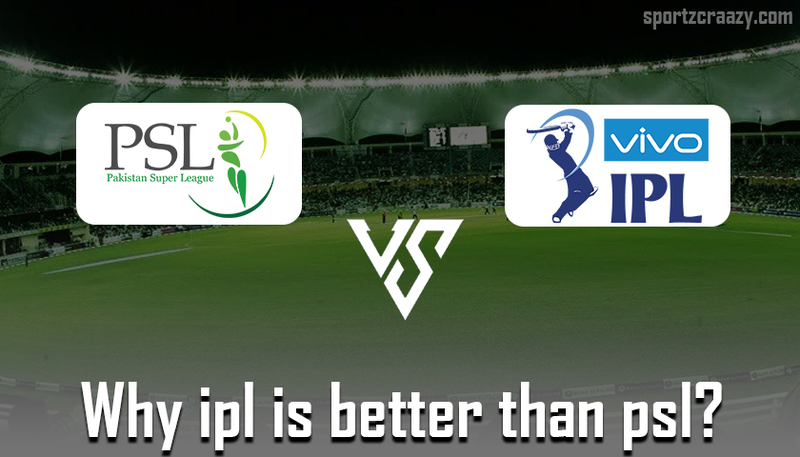 Still many people and cricket experts around the world comes along with their own arguments and perspectives in terms of its comparison with rest of the leagues and keeping the same points in mind, let us take you through to five reasons which make IPL better than PSL or any other T20 league around the world. Indian premier league has constituted around 8-10 teams during every season ever since its establishment in 2008. Even though there were teams which were suspended during its 10 year’s journey, IPL has always been able to compensate it while bringing another team in the process. Teams like Mumbai Indians, Kings XI Punjab, and Chennai Super Kings, Sunrisers Hyderabad, Bengaluru, Kolkata, Pune, Gujarat, and Rajasthan have all participated in the process. On the others hand, Pakistan super league has constituted only 5-6 teams during its 3 years journey and stands nowhere when it comes to comparing the level of participation in the whole process. Moreover, it comprised of teams like Multan sultans, Islamabad united, Peshawar Zalmi, Lahore qalandars, Karachi kings and Quetta Gladiators which have registered their participation as of yet in its 3 year’s journey. Secondly, the PSL just constitutes 34 matches around a period of one month where the IPL comprise of around 60 matches over a period of more than 50 days. Cricket is not just about the players playing the game but also about the fans who watch it from wherever they could. Also when it comes to analyzing the global outreach of IPL in terms of its audience size around the world, it stands at more than a billion in the current context. If we talk about the number games, the 2018 IPL edition saw in total 1.25 billion viewership around the globe and every year these statistics see a jump of around 22%. On the other hand, when we talk about Pakistan super league, it hasn’t been able to secure even half of the given number and even as it has completed 3 years since its inception, it still has to cover a lot of distance to match up to the Indian Premier League. 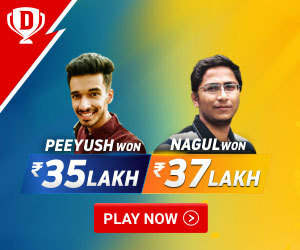 Although T20 leagues around the world function with the sole motive of bringing more exposure to the game of cricket while providing the Young players all the big chance to prove their worth along some of the biggest International names, it’s the Money factor which drives all the associated functions.IPL has come out to be the clear winner as compared to all the other T20 leagues and not just PSL as it has attracted loads of Global brands and sponsors on board. The 2018 IPL winner Chennai super kings took home a whopping INR 20 crore in the prize money whilst the runners-up Hyderabad team secured INR 12.5 crore in the process. Additionally, there were other prizes which were given to all the participating players for their Remarkable performances during the tournament. 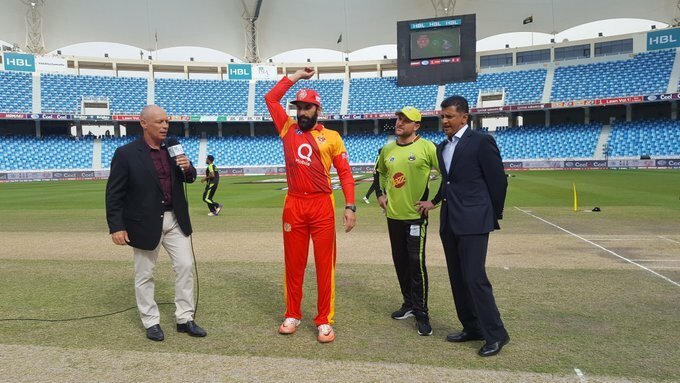 On the other hand, Islamabad united team which won the PSL 2018 edition, grabbed prize money of $ 1 million approx whilst the runners-up Karachi received prize money of $700000 in total. There were also other prizes for the best bowler, batsman, fielder, player of the season and so on just like other T20 leagues but when it comes to comparing the same with the likes of IPL, it was a “David vs. Goliath” affair in precise. 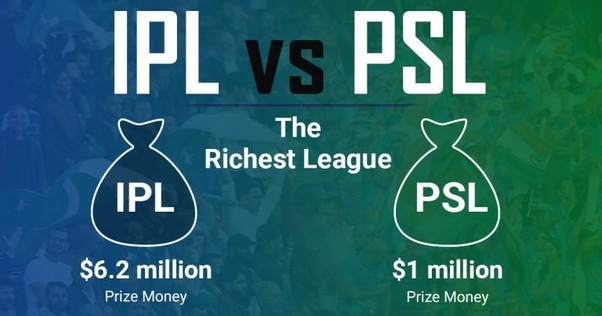 Therefore, we can certainly say that PSL got to cover a lot of distance when it comes to playing on the same Money grounds to IPL. Media coverage is something which plays a huge part in the overall popularity of any Sports tournament be it Cricket, Football or any other. Moreover, when it comes to T20 cricket and especially the IPL, it can certainly be quoted as the most followed T20 cricket tournament around the world. Although the tournament was being broadcasted by the SET India network ever since it established in the year 2008, its Global telecast rights were secured by Star India network for a humongous amount of 16,000 crore INR for a period of 5 years. The Tournament was further telecasted over a number of countries across the globe and when we compare the same to Pakistan Superleague, the data was just around half of the given number with its Global telecast to just a few of the countries in the process. You name it and you will have that player in the Indian Premier League. Such is the attraction and charm of this tournament amongst the Global International Cricket superstars. Whether it’s about the “Universal Boss” Chris Gayle or the Mr. 360 AB Devilliers, Indian Premier League simply constitutes some of the biggest and best players from around the globe. Moreover, the International Cricket Calendar is specially altered in order to accommodate this most sought after league around the year and this can certainly be quoted as a special thing about this T20 cricket league. On the other hand, Pakistan super league may have some of the best players as well, but it still doesn’t attract most of the Big names from around the Cricket world. One of the reasons in the same regards can be quoted as the absence of big money and exposure for the International players and also that they have to play a part of the league in the territories of Pakistan which has been banned by ICC ever since that infamous terrorist attack on the Sri Lankan National Cricket team.